Having had a bit of a day off, I spent some time working on Orthographic projections with the Drawing Module. One of the problems with the older implementation was that only a projection direction was provided. This meant that the GUI / SVG had to deal with applying transformations to obtain the correct projection which isn't really ideal. All this took a while to realise, however, both the projection direction and its orientation (X-Axis) can be set during the Open Cascade Projection Algorithm. 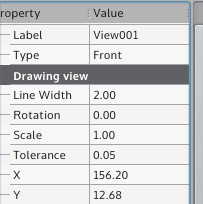 The result is above and it later will allow more convenient production of orthographic projections, by setting the view type below. The next step is to collect these orthographic projections together and allowing having these align to each other.